Vignette. Appears after 'With jellies soother [...]'. Illustration title from contents page. Line in body of text differs from title. 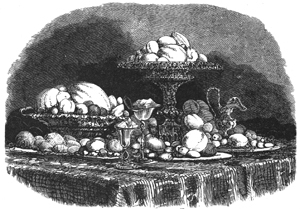 Text line reads: 'On golden dishes and in baskets bright' (p. 107).